The latest trend in travel is the adventure vacation, and visiting Africa for a Masai holiday certainly qualifies as an adventure. There are countless ethnic groups and culturally diverse areas in Africa, but the tribe of the Masai is one of the best known. There are about a million people in the tribe and their territory spans a large corridor between Kenya and Tanzania. A Masai holiday offers more than enough to excite even a seasoned traveller. I know you won't be disappointed. A Masai tribesman is a familiar sight, as these people are fairly well-known in the western world. They are often photographed draped in red fabric and usually wearing beaded jewelry. The Masai "jumping dance" is another one of their traditions that you may have seen. These nomadic people are slowly becoming more integrated with the modern world, but for the most part they still live much as they have for hundreds of years. Though taking a safari in Africa still attracts people looking to see elephants, lions and giraffes, there are more and more travellers looking to see more traditional African life. Many companies offering tours or safaris in Kenya offer trips that include visiting a traditional Masai village. In principle, a visit to a Masai village is a great experience, but some travelers report that their visit turned into a high-pressure sales event. It's crucial that you pick a good tour guide who can steer you in the right direction. Independent travellers might want to go on their own when visiting the land of the Masai. Holiday tour groups, organized by professionals, are the better route to take. I highly recommend going with others who know the people, terrain and customs in order to enjoy your trip to the fullest. Depending on the specific spots you choose to visit (the Masai lands are quite vast), you should try to time your holiday to match the wildebeest migration. It's one of the greatest animal shows there is - watch the Wildebeest migration movie in my movie gallery to see just how great... Millions of animals travel down through this corridor of land each year, to follow the rainfall patterns. If you are taking a vacation to the land of the Masai, there are lots of parks and preserves in the region that you should have on your itinerary. The world-famous Masai Mara preserve (in Kenya) as well as the Serengeti National park (in Tanzania) are both located on what was once Masai land. 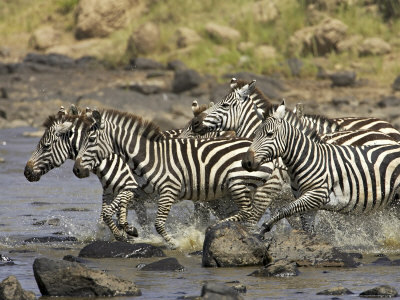 A safari to either of these parks will almost guarantee you some spectacular wildlife sightings. Even if your trip is focused on visiting the people of the Masai, you shouldn't overlook the opportunity to explore these wild game parks. Don't discount an African safari holiday just because you are not in athletic shape, either. Many tours are available that can accommodate any level of fitness, from strictly jeep-driven tours to strenuous hiking or walking tours. Access in most parks is allowed only in a vehicle, anyway. You can stay in lodges with all the comforts of home, or really experience the African grassland by sleeping outdoors in tents, which is possible starting from around $70 per person per day, including everything. A Masai holiday is truly for anyone.